If blooms are white generally speaking, you are committed to this color. You will not be able to change the color of the blooms because white varieties will be white perennially. 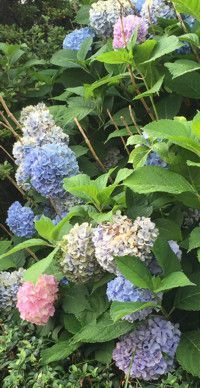 If blooms are pink or blue, then you can switch to the reverse by treating the nearby soil with either sulfur or lime depending on the target pH level. For blue blooms, you will want to acidify the soil to a pH level below 6. You can do this by applying garden sulfur (or aluminum sulfate). For pink blooms, you want a more alkaline soil (between 6 and 7) and you will want to apply garden lime, hydrated (powdered) lime, or a similar product. If unsure the exact pH level of your soil, stop by for a simple pH soil test kit in our garden department. By knowing the pH of your soil currently, you can then judge how much sulfur you would need to apply to get the soil pH to the desired level. You can over-apply garden sulfur, so be sure to follow the instructions on the sulfur that you are using. If one application was not enough to change the bloom color, then you can follow up with a second application about 1 month later.